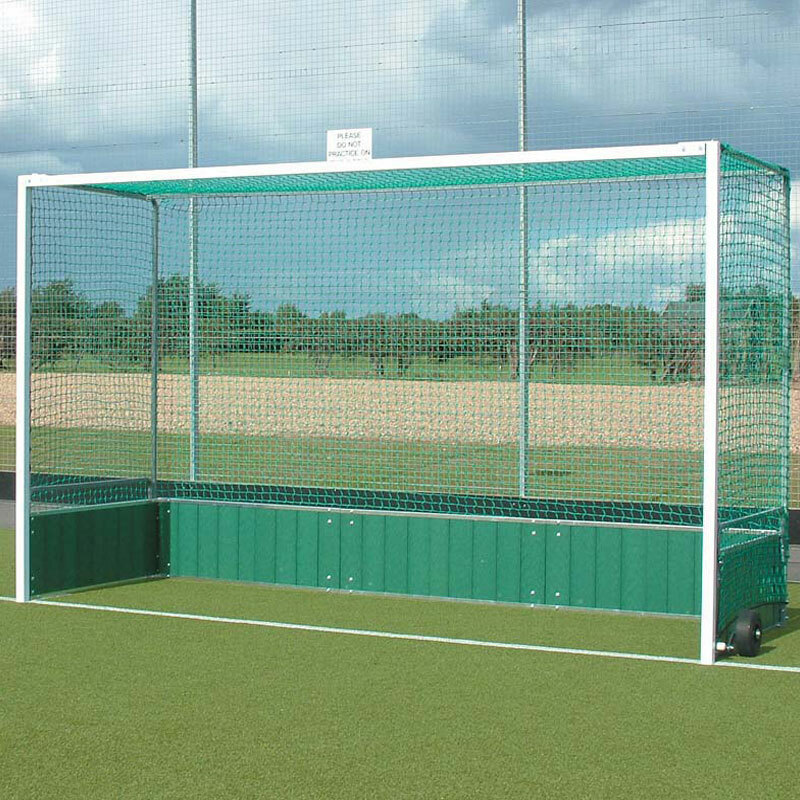 Harrod Sport ® Freestanding Steel Premier Hockey Goals are great option for all synthetic surfaces, available with regulation wooden or PVC backboards. 2 x Freestanding Steel Premier Hockey Goals. 6 x Backboard sections (3 per goal). Uprights & Crossbars made from powder coated white 50mm square x 2mm thick steel. Net retaining rods offer better net fixing while back top rail gives extra strength. Lifting handles integrated into side frame. Net supports, lifting handles and top back bar made from 25mm square pre-galvanised steel. Additional top back bar for added strength. PVC backboards are extremely durable against high impact hockey balls and is weather resistant and will not crack or warp when exposed to the elements. Please note wheels need to be ordered separately. Please search on our website for Harrod Sport Flip Over Wheel Kit Set of 4. With 460mm height x 18mm thick regulation backboard painted green. Weight 190kg per pair of Goals with Wooden Backboards. 460mm x 18mm thick PVC back and side boards. Weight 243kg per pair of Goals with PVC Backboards. 3.66m x 2.14m (12` x 7`). Lost the instructions for your Harrod Sport ® Freestanding Steel Premier Hockey Goals? Please Click Here to download a new copy.